This year I had the chance to visit the white flowering form of Cephalanthera rubra in the Hesse part of the Rhoen some days earlier than last year. But first I followed a hint and looked up a place further in the South, near Ahlersbach. Quite near a path through the forest a white Cephalanthera rubra with a slight hue of pink! The pink colour is well visible in the buds, where the remaining pigments are more concentrated than in the opened flower. 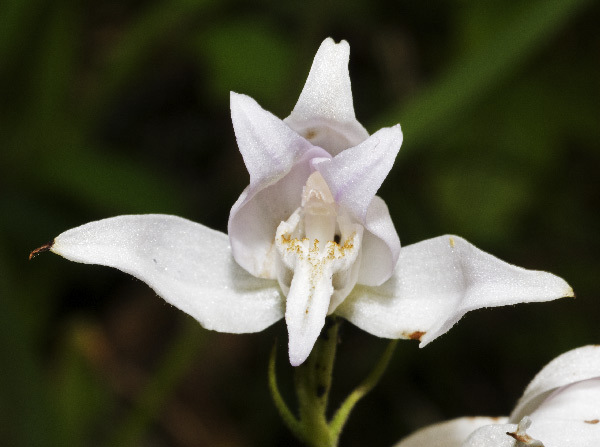 At the second place near Huenfeld, characterized by an old beech mentioned by Marco Klueber in his great book about “Orchids in the Rhoen” the albiflora plants of Cephalanthera rubra are splendidly flowering. 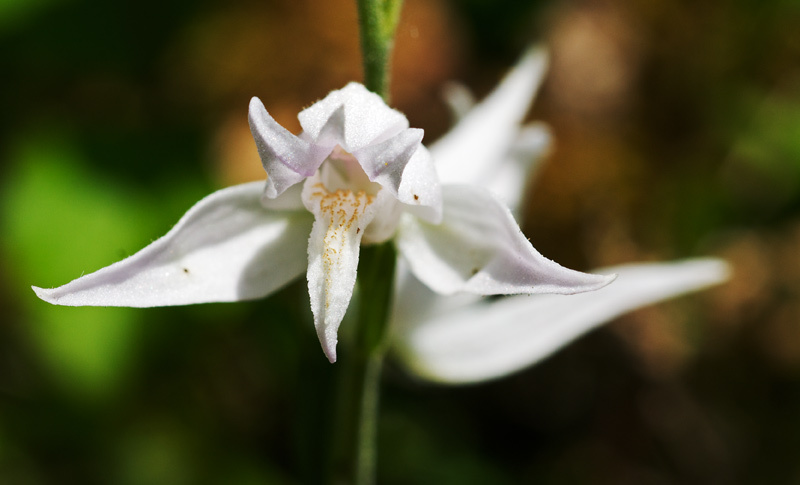 The Swedish botanist L. Anders Nilsson showed (in an article in Nature, 1984) that Cephalanthera rubra mimics the floral coloration of Campanula in the visual system of bees in order to be pollinated by them, especially by male bees of the genus Chelostoma. Since Cephalanthera rubra is flowering before Campanula, they are quite attractive for the bees. 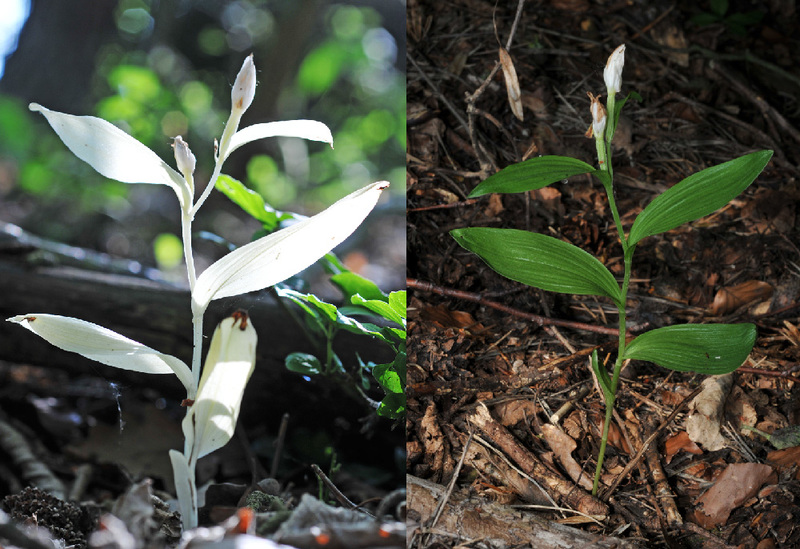 It would be interesting to see how bees are reacting to the albiflora forms of Cephalanthera rubra. With regard to pollinators my visit on June 24th had a special highlight when I saw a wasp (Argogorytes mystaceus) pollinating Ophrys insectifera. The insect pseudocopulated two flowers in a timeframe of more than seven minutes. 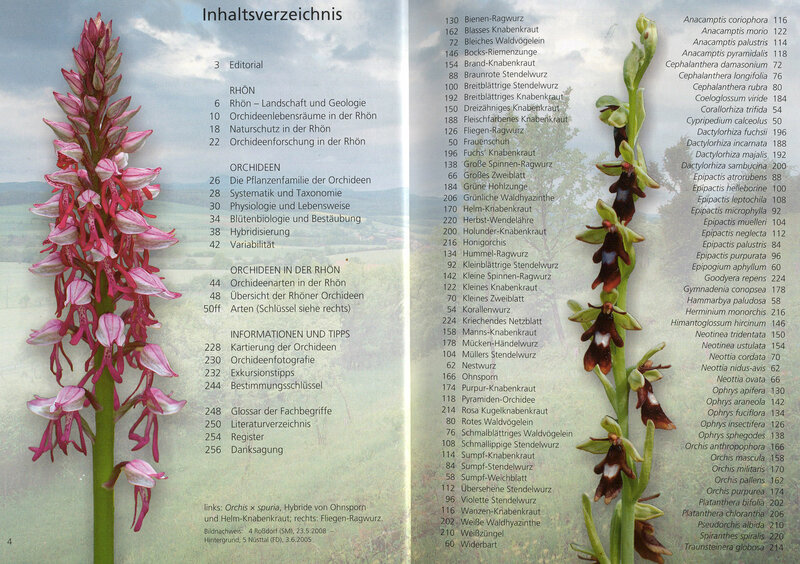 A new publication presents a showcase of all the orchids to be found in the Rhoen Region of central Germany. In this book, the author and photographer Marco Klueber presents a summary of his research in this hilly region. He explains how geological and geographical conditions formed different habitats as there are several types of forests, grassland and marsh areas. There are 48 different species of orchids growing in this region or confirmed to have been grown there in past times. There are five species which can’t be found today in the Rhoen. Their presentation is a memorial and at the same time a challenge to do everything to preserve these treasures of nature. And Klueber’s publication is an important contribution to such efforts. Only public awareness offers the basis for the necessary political decisions to protect those regions. 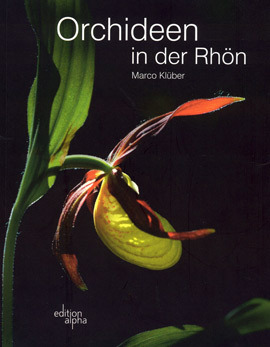 Following the hint of an orchid friend, today I’m travelling to the Hesse part of the mountain region Rhoen. Northeast of Fulda, near Huenfeld, a path is leading through a long stretch of forest. 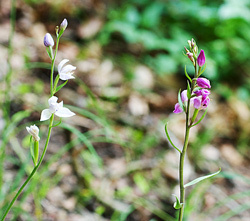 Along a slope there are flowering countless Cephalanthera rubra. And directly at the path there are three plants with white flowers. Die first still has a slight violett hue. The second is totally white, but already slightly withering, and the third has only one, relative closed flower. Along the slope there are more than one hundred Cephalanthera rubra, Gymnadenia conopsea and Epipactis atrorubens. There is one Gymnadenia conopsea flowering almost white, with a last hue of violett in the flowers. South of Fulda and west of Bad Brueckenau we follow another hint and find a hilltop with an impressive grassland vegetation. In the lower range there are numerous Gymnadenia conopsea. Farther above, some meters from the forest, there are Epipactis atrorubens flowering – and among them some plants, which are not flowering red-brown, but yellowish-green! While strolling this wonderful slope, I’m seeing a white flowering Gymnadenia conopsea var. albiflora! It is a strong plant with more than 30 flowers, the upper ones still as buds. On the hill there are many butterflies and wild bees. The white flowering Gymnadenia is offering them with its spur filled with nectar as an interesting alternative.